German Chancellor Angela Merkel says she could back a eurozone finance minister and eurozone budget "if the circumstances are right". French President Emmanuel Macron has argued strongly for both, in order to reform the eurozone. Germany is wary of any move that might lead to a "transfer union" - a common budget used to prop up indebted governments in the 19-nation eurozone. Many Germans resent the billions of euros spent on bailing out Greece. The Berlin government does not want German taxpayers to have to underwrite high spending elsewhere in the EU without oversight. 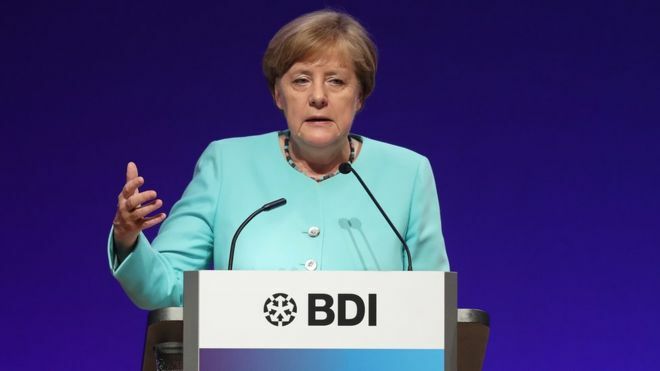 Mrs Merkel said sensible changes could be introduced if they could be sure of improving the lives of European citizens, including generating work for young people. She was addressing German business leaders in Berlin. "We could also consider a euro-budget if it is clear that we are really strengthening the structure of the economy and doing sensible things," she said. President Macron's strongly pro-EU stance has boosted Mrs Merkel's position in the run-up to Germany's general elections in September. But reforming the eurozone remains a major challenge. The 2008 financial crash and subsequent eurozone debt crisis led to high unemployment and painful public sector cuts in much of Europe.